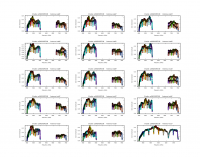 This is an Advanced EVLA data reduction tutorial that calibrates and images a 6-cm wide-band continuum dataset. This casaguide is for Version 4.1.0 of CASA. 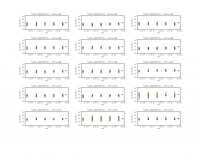 This article describes the calibration and imaging of a single-pointing 6-cm EVLA wideband continuum dataset of the galaxy NGC2967 (UGC5180) which was the location of the supernova candidate SN2010FZ. No supernova was detected in this observation, but the galactic continuum emission from this face-on spiral is nicely imaged. 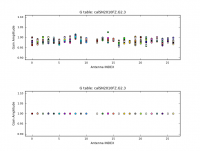 The data were taken in with 1024 MHz of bandwidth in each of two widely spaced basebands (each comprised of 8 128-MHz spectral windows), spanning 4.5 to 7.5 GHz. We will use wideband imaging techniques in this tutorial. 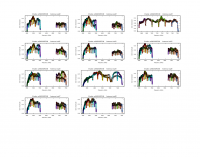 This is a more advanced tutorial, and if you are a relative novice (and particularly for EVLA continuum calibration and imaging), it is strongly recommended that you start with the EVLA Continuum Tutorial 3C391 (at least read it through) before tackling this dataset. We will not include basic information on CASA processing in this tutorial. In this tutorial we will be invoking the tasks as function calls. You can cut and paste these to your casapy session. We also recommend that you copy all the commands you use, with any relevant commentary, to a text file. This is good practice when tackling large datasets. If you wish, you can use the Script Extractor to create a file with the tutorial commands, which can subsequently be edited as desired. Occasionally we will be setting Python variables (e.g. as lists for flags) outside the function call so make sure you set those before running the task command. Note that when you call a CASA task as a function the task parameters you do not set in the function call (assuming there is at least one) will be set to their defaults, and will not use values you set in previous calls or outside the call. See Getting_Started_in_CASA#Task_Execution for more on calling tasks and setting parameters in the scripting interface. NOTE: If you find that the figures on the right margin of the browser window overlap the text too much and make reading difficult, go ahead and widen the browser window. 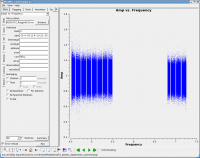 The data for this tutorial were taken with the EVLA under program AS1015 as the scheduling block (SB) AS1015_sb1658169_1.55388.89474846065, and was run on 2010-07-11 from 21:28 to 22:28 UT (size 37.74GB). If you are brave enough, you can also get the data straight from the EVLA archive. 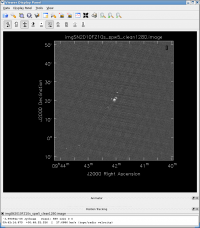 Go to the NRAO Science Data Archive, and search for project **AS1015**. Then select the AS1015_sb1658169_1.55388.89474846065 dataset and choose to apply the online flags (check box "Apply flags generated during observing") and time-averaging of 10 seconds. (The data were taken in D-configuration [max baselines 1km], so one can safely average to 3s or even 10s to reduce dataset size.) Also select the tar option. This will create a file equivalent to what is used at the workshop. This will run a script to initialize CASA, setting paths appropriately. It will also start writing to a file called ipython.log, which will contain a record of all the text you enter at the CASA prompt. A logger window will also appear; note that you can rescale this window or change the font size as desired (the latter is under "View"). The messages which are printed to the logger are also saved to a file called casalog.py, and any previous version of casalog.py which may have been present is moved to a backup version with a date stamp. Note that this does not happen for any previous versions of ipython.log, so if you wish to save one, be sure to rename it before restarting CASA. Observer: Dr. Alicia M. Soderberg     Project: T.B.D. This task displays a lot of information about the MS. We can see that the observation was performed with the EVLA, for a total integration of 3359 seconds (1 hour). The number of data records (1570726) is equal to the number of baselines (N_antenna * [N_antenna - 1] / 2) X the number of integrations (observing time / time-average binning) X the number of spectral windows. For this observation, this is roughly 351 baselines (27X26/2) X 360 integrations (3600s total/10s avg) X 16 spectral windows = 2021760. Note that this is high by ~30%; this is because the archive already flagged bad data, and there are some scans which only have two (rather than 16) spectral windows present. Extra exercise: examine the MS using browsetable to see what a data record looks like (equivalent to a row, as displayed by this task). The most useful parts of the listobs output are the scan, field, and spectral window listings. 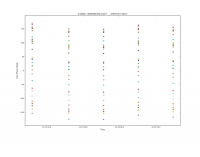 From the spectral window information, we can see that there were a total of 18 (0 through 17) spectral windows in this dataset. The first two of these (0 and 1) were only used to help set up the correlator. Looking at the scan listing, we can see that the first four scans which are present used only these spectral windows. These are referred to as "dummy scans". We will not be using these, since they often contain bad data. 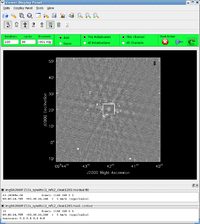 The C-band data of interest is contained in scans 6-44 and spectral windows 2 to 17. Careful examination shows that scan 8 is missing but from the time ranges that the data has been merged into scan 7. This sort of correlator back-end data-capture issue was occasionally seen during 2010. Hopefully, it will not affect our data, but we should keep an eye out for problems with scan 7. 3C286 (2), which will serve as a calibrator for the visibility amplitudes, i.e., it is assumed to have a precisely known flux density; as well as the spectral bandpass. You can examine the commands stored in the FLAG_CMD table using flagcmd. These will go to the logger. 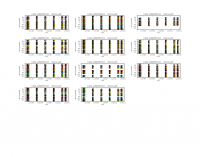 Note that we are only plotting the first 285 rows -- this is because the last few are from flagging zeros in the data (caused by correlator errors) and data which have been flagged due to antenna shadowing. Note that you can not do the tablerows selection and plot those too, you will just get lines at the bottom marked as "All" antennas for these flags. The flags as plotted in the figure to the above right look normal. They are color-coded by REASON, and you see ANTENNA_NOT_ON_SOURCE flags between scans, and the occasional SUBREFLECTOR_ERROR flag also between scans (most likely after band changes when the subreflector rotates to pick up the new feed on the ring, some are slower than others). What you watch for here are long blocks of unexpected flags, which might be false alarms and cause you to flag too much data. 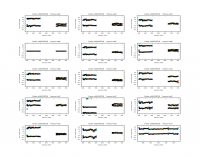 In that case, look at the data itself in plotms (see below for examples) to decide whether or not to apply all flags. Now we examine the MS looking for bad data to flag. 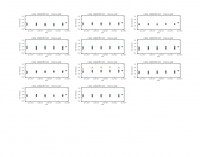 We will use plotms to bring up an interactive GUI that will display 2-D Y vs.X style line plots. NOTE: We do not recommend using the editing/flagging features of plotms. It is very easy to mess up your data this way. Also, to improve speed we will be restricting the scope of plotting so most box/flag operations would not get rid of all the bad data. We will instead use plotms to identify bad data and then use flagcmd to flag it. This will also allow full scripting of the flagging, which is ultimately the best way to keep track of what's been deleted. 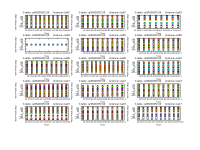 Given the large dataset sizes now being generated, reproducibility is extremely important. Imaging spending a day flagging your data, then a disk error corrupts the MS. It's imperative that you have an automated way to regenerate your work. This is also why we encourage you to keep a running file with all the commands you use on a dataset. WARNING: The Flag button on the plotms GUI is close to other buttons you will be using, in particular the one that gets rid of boxes you have drawn. Be careful and don't hit the Flag button by mistake! Here, we can see the alternating phase calibration and science target scans, as well as the (brighter) flux calibrator at the end of the observation. Feel free to play with ways to view, or color the data: for example, go to the "Display" left-hand tab, and choose "Colorize by: Field". You can also change the size of the plotted points, if they are too small to see easily, by setting "Unflagged Points Symbol" to "Custom" and increasing the number of pixels under "Style". There is clearly less data for spw 11, and use of Locate shows spw 11 data only for ea02,ea03,04,08,09,11,12. We will later delete this incomplete spw. Note also the very strong RFI spike at 6614 MHz (spw 10 ch 63) with clear ringing contaminating both spw 10 and 11. There is also a tremendous roll-off in spw 10. We will drop these spectral window when we process the data. You see the slopes due to residual delays. Mostly a turn or less over a 128MHz subband, but there are some outliers. Step through to ea20. You see that there is a very large delay in RR (via locate) for the first baseband (spw 0~7). We will delete this (will also delete LL so there are no orphan polarization products, which would be ignored by clean in the imaging stage). Note ea17 and ea25 baselines drop close to zero in the middle of upper baseband (e.g. plot 'ea17&ea25') so we will delete these. These commands will be carried out as well as being added to the FLAG_CMD table (marked as applied). For now we will not flag these spectral windows, but note the bad channels, which we will mask out when creating continuum calibration tables and images. Finally, split off the good scans and spw, this will allow us to work on the data without having to start completely over (if we mess something up badly) as well as letting us do simpler data selections. Note that we do not include spw 10, because of the bad RFI, or spw 11, because of the many missing antennas. 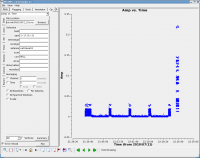 This shows the times where data is present on baselines TO a given Antenna2 (which means there is no line for ea01 which is antenna 0). You can pick up ea01 (and drop ea28) by setting yaxis='antenna1'. To the right we show this plot, having zoomed in on the last scan on 3C286. You see here that some antennas are present in this scan earlier than others (e.g. ea02 comes in one 10s integration later than ea04). Note that the spectral windows are re-numbered to 0 through 13. It is now time to begin calibrating the data. 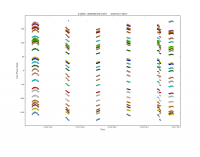 The general data reduction strategy is to derive a series of scaling factors or corrections from the calibrators, which are then collectively applied to the science data. For much more discussion of the philosophy, strategy, and implementation of calibration of synthesis data within CASA, see Synthesis Calibration in the CASA Cookbook and User Reference Manual . Inspecting the logger report shows that 3C286 is about 7.7 Jy at lower end of the band to 5.7 Jy at the upper end. Some calibration products are carried along throughout the calibration process and used as priors for subsequent calibration steps. 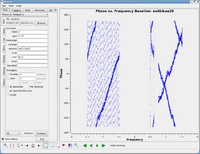 These include the antenna position corrections, gain-elevation curves, and requantizer gains. Note that there are significant position corrections for a number of the antennas. 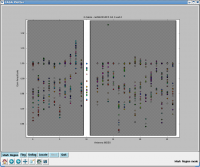 Finally, we will use gencal to create a calibration table containing corrections for the requantizer gains. Although this is only necessary for 3-bit data (and our SN2010FZ is 8-bit), we include it here for completeness. It will not affect the calibration for our 8-bit data, but if one is following this CASA Guide as a template for 3-bit data, this step is needed to account for the small gain changes (~5-10%) that result from resetting the quantizer gains as the correlator changes to a new 3-bit configuration. Since we're running gencal on 3-bit data, it logs that it found "0 TIME/SPW switched power samples." 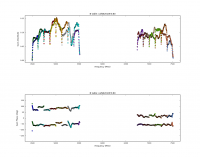 The caltables we have generated -- calSN2010FZ.antpos, calSN2010FZ.gaincurve, and calSN2010FZ.requantizer -- will need to be pre-applied in subsequent calibration steps. gaincurve=False : DO NOT use the intrinsic gaincurve application, we have supplied a caltable for this! 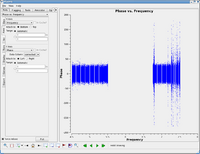 We can now solve for the residual antenna-based delays that we saw in phase vs. frequency. This uses the new gaintype='K' option in gaincal. Note that this currently does not do a "global fringe-fitting" solution for delays, but instead does a baseline-based delay solution to all baselines to the refant, treating these as antenna-based delays. In most cases with high-enough S/N to get baseline-based delay solutions this will suffice. We avoid the beginning of spw 0 due to the extreme roll-off (with loss of S/N) at the starting edge. The delays range from around -6 to 6 nanoseconds. 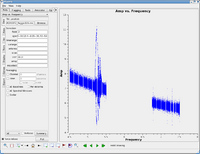 These are in the first two edge channels of the first spw where the response is low, and not unexpected. In the logger you will also see reports of reference antennas jumping in those channels, which can be be safely ignored (we will drop those channels later anyway). 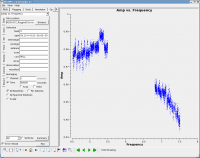 This is the first amplitude-scaling calibration that we do, so it is important to have used the calSN2010FZ.gaincurve caltable (or set gaincurve=True). If we were at higher frequency we would also have made an opacity caltable (or set opacity). (this can take a long time to plot). Because our flux density calibrator 3C286 is bright enough, we were able to use this as the bandpass calibrator. Since setjy put the correct spectrum for 3C286 into the MODEL_DATA column, our bandpass will reflect the true bandpass of the instrument. However, if for your observation you were unable to use a source of known spectrum as the bandpass calibrator, then you would need to use the output of fluxscale later on to bootstrap a setjy on your bandpass source using the derived spectral index information. Now solve for amplitudes on a per scan interval, after applying the per-integration phases. Do these separately using gainfield so phases don't get transferred across fields. 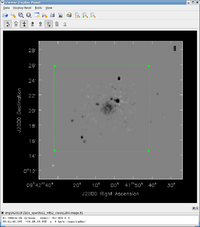 For field 2 (3C286) we use combine='scan' as there are two scans on this source, with the first one having much less data (and will thus give a noisy solution on its own). Note that gaincal uses linear interpolation of the previously determined phases by default, so set this to "nearest" if you want to override this. 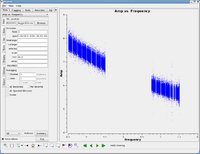 We do a second version of the amplitude calibration, this time using combine='scan' on field 0. 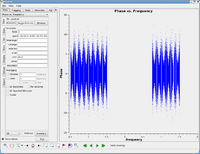 This is to use for input to fluxscale in the next step. where we have captured the returned dictionary in the Python variable myflux. We have use the incremental=True option (new to CASA 4.0) to make this table contain only the scale factors per-antenna per-spw per-field needed to scale the data (rather than rescaling the input table). Thus it can be applied in addition to our G2 table even though it was derived from the G3 table. You may see slightly different numbers on your machine. Note that "N" here is the number of antennas x the number of polarizations used for the calculations; in this case, there are 24 unflagged antennas and 2 polarizations. As of CASA 4.0, fluxscale now returns a fitted spectral index and curvature, which can be input to setjy if you want to use these derived fluxes for a model. As it so happens, the derived flux for J0925+0019 is about 1 Jy (you can plot up the raw amplitudes for fields 0,2 and convince yourself this is indeed true and not a bug). The spectrum rises a bit to peak in spw 6 then falls again. For 3C286 (field 2) we did short-timescale phase solutions and a single scan amplitude, so use "linear" and "nearest" interpolation respectively. For the target source we use field 0 to calibrate field 1, so use "linear" interpolation. This takes a few minutes. Because we used usesratch=False in setjy, the CORRECTED_DATA scratch column will be created the first time you run applycal. This will store the calibrated data. This now looks clean except for the RFI in the upper subbands. Note the characteristic "bowtie" pattern of the phases about the sub-band centers. Here we can see the effect of the EVLA "delay clunking", where the delay steps through discrete values such that the phase goes from -11deg to +11deg across the sub-band as the delay changes due to geometry. This is D-configuration so the delays change slowly, it will change faster in wider configurations. As of Q3 2011 we have not enabled the corrections for this in the EVLA system so you will always have this remaining delay error in your data. In principle, you could solve for delays on short timescales and take this out; in practice, this in not possible for your weaker science target source (where it would matter most for results). The ch 20 ones are all harmonics of a notorious 128 MHz tone. NOTE: You can get the frequency of a RFI feature by looking at the logger report from using the Locate tool. Without further flagging, it may be best to drop spw 12-13 for imaging (we will do so from now on). 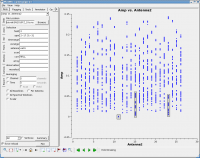 The "custom" plotting parameters show how to control the symbol shape and size from the task. Also, there is an offset with the amplitudes for spw 6, perhaps due to the problem with baseline ea17&ea25 (which we flagged, but didn't recalibrate afterward) and likely affected the fluxscale solution. This is troubling enough that we will quickly go through a second round of calibration. Note that we have set the variable chanStr for our channel selection; this makes the task commands shorter and easier to read. The inability of this run to get a spectral index and curvature is due to the flagged/missing solutions for spw 12 and 13. The code will be fixed in an upcoming release to not give this error. we see that there are variations that will enter into the medians. Some antennas are better behaved than others, for example ea12 (index 10) seems better than most. Note that if you choose a different antenna than ea12 to use for this, you will get different results, usually worse. But this procedure illustrates how to use the incremental solutions from fluxscale to your possible advantage. We now return to examining our calibration. In this case, we can see the residual effect of the EVLA "delay clunking" described above, but it is reduced due to the averaging that we applied, but it is still there. Alas, the upper baseband still has lots of low level RFI. Now split off the data for calibrators and target, to avoid later issues that can corrupt the MSs. We don't keep spw 12-15, since they weren't included in the last round of calibration, and we don't plan to image them. Our data spans 4.5-7.5 GHz: this is a relatively large fractional bandwidth, resulting in substantial variation of the field of view over the entire frequency range. 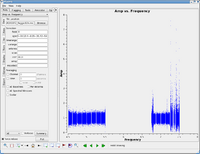 FOV = 45 arcmin / Frequency (GHz), giving 10 arcmin at 4.5 GHz, and 6 arcmin at 7.5 GHz. Likewise, the synthesized beam ranges from 16" at 4.5 GHz to 9.6" at 7.5 GHz. We want to subsample the synthesized beam by a factor of 3-4, so will use a cellsize of 3". To cover the full FOV (keeping it at the inner part of the image) at the lowest frequencies, we will want an image size of >400 pixels, or >20 arcmin. Due to the numerology of FFTW's (which clean uses under the hood for FFTs) optimal sizes, imsize should be composite number with two and only two prime factors chosen from 2, 3, and 5. Taking into account the x1.2 padding that clean uses internally to the imsize you give it (and 1.2 = 2*3/5), we choose 640 or 1280 as our imsize (640 = 2^7*5). Other reasonable sets would be 405, 1215, etc. (405 = 3^4*5) or 432, 648, 1296 (these are 2^n*3^m*5). In practice, if you give it non-optimal values for imsize, you may find that the transforms take a bit longer, which is noticeable if you are doing interactive clean. WARNING: By default, a single-field nterms=1 clean does NOT use Cotton-Schwab (CS) clean to break into major cycles going back to data residuals, it just does cleaning in a bunch of minor cycles in the image plane. This can give much poorer imaging quality in cases with poor uv coverage (snapshots) or in the case of complex emission structure (like ours) -- clean tends to diverge in this case. You should explicitly set imagermode='csclean' in your call to clean. Also, in our case the psf is very good using mfs, so by default it will not take many major cycle breaks. We use the cyclefactor parameter to control this, which sets the break threshold to be cyclefactor times the max psf sidelobe level (outside the main peak). We start at cyclefactor=1.5 in a single spw, and ratchet it up to 4.5 when we clean all the spw. This seems to work ok. Rule of thumb is if it is gobbling up many hundreds of clean iterations in the minor cycles early on, increase cyclefactor. 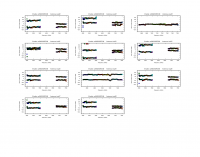 Conversely, if your psf is poor but you source structure is simple, you can reduce cyclefactor (e.g. below 1) to stop it from taking lots of extra major cycles. 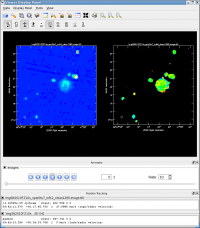 For more information on using clean, in particular on using the interactive GUI, see EVLA_Continuum_Tutorial_3C391#Imaging. WARNING: In CASA 4.0 the GUI interface for clean and the viewer has changed slightly. Some of the screenshots shown below may differ slightly from what you see. NOTE: If you are pressed for time, then you might want to jump ahead to EVLA_6-cm_Wideband_Tutorial_SN2010FZ_(Caltech)#Cleaning_the_lower_baseband_using_two_MFS_Taylor_terms and while it is cleaning you can read the other Imaging descriptions. Let us start by interactively cleaning one of the lower baseband spw (spw 5 in this example). NOTE: this first time will take a few minutes at start to create scratch columns in the MS in case we want to do self-calibration later. of the extended emission in the center of the map. This decreases as you clean out this emission. Stop cleaning when the residuals look like noise (and you cannot clearly see sources). The top figure to the right shows a zoom in on the end state of the clean, where we have marked a number of boxes and cleaned them out. Sure enough, there is a bright source near the lower left (see middle panel at right). Box it, clean it a bit, and look again. There is a second source in the mid-left (track it down by its sidelobes). Box this one, clean it a bit, and when satisfied stop. You can use the CASA viewer to display the images that clean creates. If you need more guidance on using the viewer, see the CASA Viewer Demo video (note that this is for a much earlier version of the viewer, and the interface has changed since then). The restored image is shown in the bottom panel to the right. I have chosen the Grayscale1 instead of default color map as I prefer "Grayscale" to false color "Rainbow" for assessing image quality. Also, you can change the scaling of the image using the "scaling power cycles" slider under "basic settings". In this particular case, it's 31.8 uJy; yours will likely be slightly different. 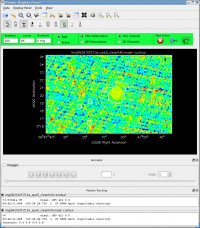 Now, image the entire lower baseband (spw 0-7). 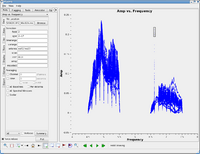 Follow same iterative procedure as before, and get the best residuals you can without "cleaning the noise". Because of the bandwidth and frequency synthesis, the sidelobe pattern is different than before and it is much easier to see fainter emission. Be careful cleaning sources that lie near or on sidelobe splotches. Clean the central emission region way down first to reduce the sidelobe level before adding components in the sidelobe areas. 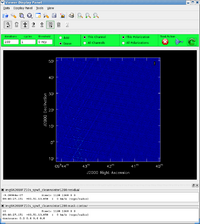 For this run, the rms is 11.3 uJy (and there is clearly some structure left in the residual). To the right is a zoom-in on the center of the restored image. 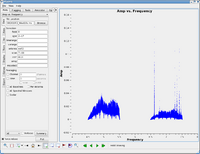 so negative spectral indexes indicate a "steep" spectrum (falling with frequency). For this run, the rms is 10.5 uJy (somewhat better-looking than the nterms=1). The top screenshot to the right shows an intermediate but early stage of cleaning where we are looking at the central emission and cleaning it out slowly. 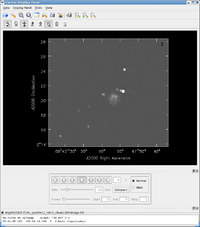 and then use the Open Data panel to load the spectral index image imgSN2010FZ10s_spw0to7_mfs2_clean1280.image.alpha which can then be blinked (optionally plotted side-by-side using the Panel Display Options panel to set 2 panels in the x direction). This will use 0.1 mJy (or 10 x the sigma we found) as the cutoff. You can then view or manipulate the filtered alpha image as normal. The lower panel to the right shows the intensity and LEL-filtered alpha images side-by-side in the viewer, zoomed in on the galaxy emission. Mousing over the alpha shows spectral indexes ranging from -1 to +1 in the center, with the brightest emission with alpha -0.7 in the knots in the disk. For the ultimate image, use the "clean" part of the upper baseband in addition to the lower (use spw 0-11). We will use mfs with nterms=2 (if you try nterms=1 on this wide bandwidth you will get much poorer residuals). Because of the added work and extra data involved, this will take much longer than our other runs of clean. Therefore, we will get a head start by doing a non-interactive clean using the mask left from the previous clean (spw 0-7). We will insert a clean threshold to limit runaway cleaning too far beneath the noise level. This will take a while, especially if there are other processes running on your machine (with nothing else running, expect ~30-40 minutes). For this particular run, the rms was 8.9 uJy (noticeably better than the lower baseband only results). You might find a few more sources revealed in the outer parts of the image, and also more emission around the galaxy disk in the center. Try drawing new boxes, perhaps extend the box in the center, and do ~100-1000 more iterations. At the end, what is left should be dominated by the error patterns from mis-calibration. Only self-calibration will get rid of these. Stop cleaning for now. 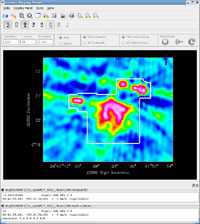 See the figure to the right for the interactive display panel showing final residuals and mask (changing the colormap to Greyscale 1). The final rms achieved here is 8.6 uJy; slightly better. (listing columns truncated) and we estimate about 37 minutes on target. We had about 25 antennas on average, and our spw selection picked out 610 channels (2 MHz each) for a total of 1220 MHz bandwidth. If we plug this into the EVLA exposure calculator, at 5 GHz, we find that we expect a rms thermal noise level of 8.7 uJy, and at 7 GHz, 7.0 uJy. So, our values are within the expected range (a bit higher than theoretical, but that's expected). Zoom in on the center (see figure to the right). The emission in this source is on the steep side. At this point we do not know how reliable this is or what we expect (though our calibrators come out with correct spectral indexes if we image them the same way). 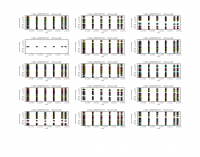 But this illustrates a way to extract spectral information from our wideband mfs images. from their RC3 album (courtesy D.Hogg, M.Blanton, SDSS collaboration - see #Credits). This looks like a nice nearby face-on spiral galaxy. 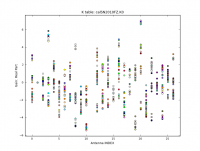 How does our 6cm continuum emission line up with the optical? 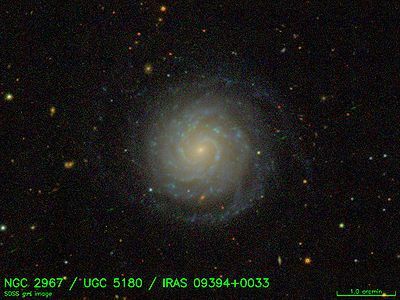 You can also find this image, named NGC_2967_UGC_5180_IRAS_09394+0033-i.fits, on the web at http://casa.nrao.edu/Data/EVLA/SN2010FZ/NGC_2967_UGC_5180_IRAS_09394+0033-i.fits (at the CASA workshop, it's in /data/casa/evla/ or a similar location that will be given to you in the instructions). Load it into your viewer, and blink against our 6cm image. The figure below shows the SDSS contours overlaid on our 6cm image (after fiddling with the colormap shift/slope for the EVLA raster image). This is shown in the figure below. 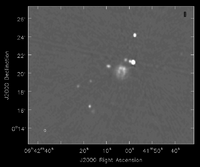 Is the compact 6cm emission in upper left associated with a spiral arm? 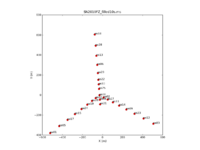 Use multi-scale clean by adding non-zero scales to the multiscale parameter. Try the testautoflag task (in 3.3.0 and later) to automatically flag RFI from the upper sideband. There is more information on running testautoflag in this tutorial. 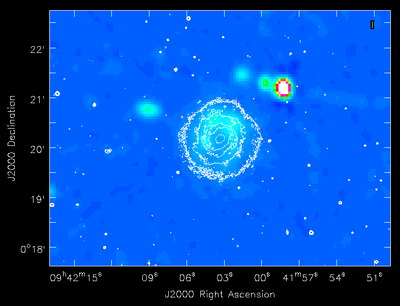 The EVLA data was taken by A. Soderberg et al. as part of project AS1015. 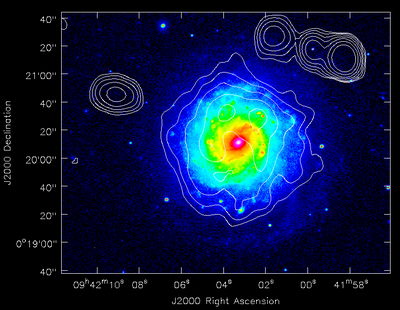 See NRAO eNews 3.8 (1-Sep-2010) for more on this result. The Expanded Very Large Array (EVLA) is a partnership of the United States, Canada, and Mexico. The EVLA is funded in the United States by the National Science Foundation, in Canada by the National Research Council, and in Mexico by the Comisión Nacional de Investigación Científica y Tecnológica (CONICyT). SDSS image courtesy David Hogg & Michael Blanton, private communication. 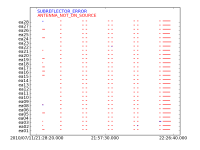 Data comes from SDSS DR7, see Abazajian et. al 2009. Funding for the SDSS and SDSS-II has been provided by the Alfred P. Sloan Foundation, the Participating Institutions, the National Science Foundation, the U.S. Department of Energy, the National Aeronautics and Space Administration, the Japanese Monbukagakusho, the Max Planck Society, and the Higher Education Funding Council for England. The SDSS Web Site is . The SDSS is managed by the Astrophysical Research Consortium for the Participating Institutions. The Participating Institutions are the American Museum of Natural History, Astrophysical Institute Potsdam, University of Basel, University of Cambridge, Case Western Reserve University, University of Chicago, Drexel University, Fermilab, the Institute for Advanced Study, the Japan Participation Group, Johns Hopkins University, the Joint Institute for Nuclear Astrophysics, the Kavli Institute for Particle Astrophysics and Cosmology, the Korean Scientist Group, the Chinese Academy of Sciences (LAMOST), Los Alamos National Laboratory, the Max-Planck-Institute for Astronomy (MPIA), the Max-Planck-Institute for Astrophysics (MPA), New Mexico State University, Ohio State University, University of Pittsburgh, University of Portsmouth, Princeton University, the United States Naval Observatory, and the University of Washington. This page was last modified on 4 February 2014, at 19:51.